Posted February 28, 2018 by The Rapid & filed under Places to Go. 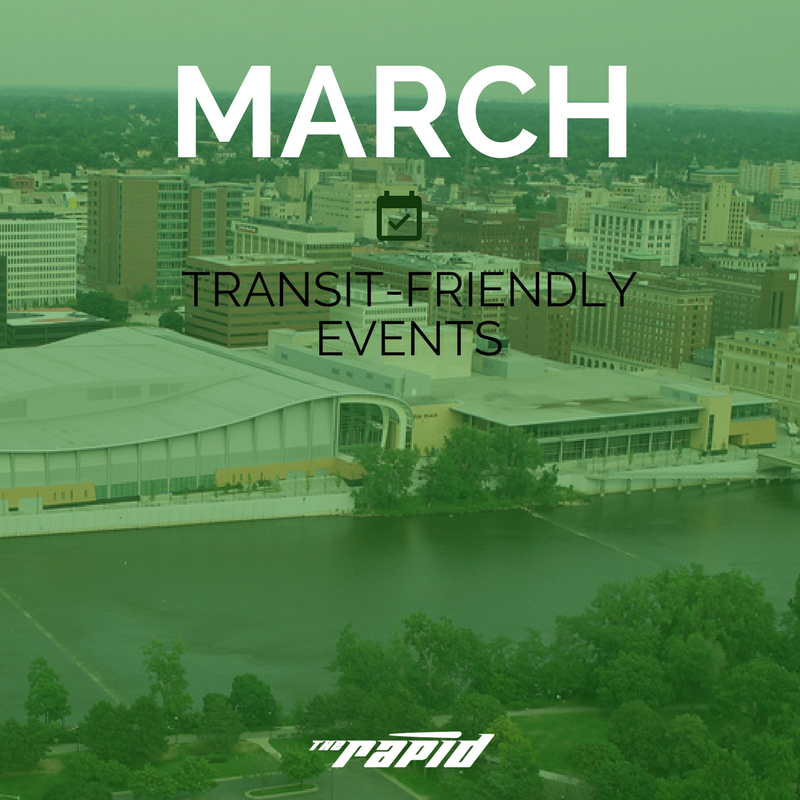 March is a busy month for Grand Rapids. We have Beer Month GR, Laughfest, St. Patrick’s Day and so many events at DeVos Place. There are so many reasons to get out and enjoy all the community has to offer. Beat those winter blues by getting out and riding The Rapid to a variety of events. Savor the craft until March 15 with Beer Month GR! Experience Grand Rapids is highlighting our city’s love of craft beer with a month-long celebration. The Rapid to check out local restaurant specials for Cool Brews. Hot Eats., Founders KBS Week tap takeovers and more. There’s something for every beer lover to indulge in during Beer Month GR. Don’t forget your Beer City Brewsader® Passport! Check out the event list and plan your trip. Love gardening? Prepare for spring at DeVos Place on March 1-4. This season’s show features 14 gardens, 5 free seminar stages and over 350 exhibitors featuring every product and service you’ll need. Single-day and multi-day tickets are available with prices ranging from $10 to $18. Admission for children 6-14 is $4 and children 5 and under get in for free. Routes SL, 11, 13, 50 can get you there. From March 6-11, ride to DeVos Performance Hall. The Silver Line can get you just steps away from the front door to see this award-winning musical starring Grammy® Award-nominee and R&B superstar Deborah Cox! The plot involves a former Secret Service agent turned bodyguard, Frank Farmer, who is hired to protect superstar Rachel Marron from an unknown stalker. Each expects to be in charge; what they don’t expect is to fall in love. A breathtakingly romantic thriller, The Bodyguard features a host of irresistible classics including Queen of the Night, So Emotional, One Moment in Time, Saving All My Love, Run to You, I Have Nothing, I Wanna Dance with Somebody and one of the biggest selling songs of all time – I Will Always Love You. Based on Lawrence Kasdan’s Oscar-nominated Warner Bros. film and adapted by Academy Award winner (Birdman) Alexander Dinelaris, The Bodyguard had its world premiere in London’s West End where it was nominated for four Laurence Olivier Awards including Best New Musical and won Best New Musical at the Whatsonstage Awards. Get your tickets here. Routes SL, 11, 13, 50 can get you there. This fun shopping event at DeVos Place is catered to women and their families. From March 9-11, come out for more than 300 exhibits involving health, wellness, beauty, fashion, food, fitness, travel and so much more. Make a girl’s day and grab some friends to join you. This event is for women of all ages. Get your tickets here starting at $10. Grab your family and take a ride to the Grand Rapids Public Museum throughout March to see experience the watershed as a water drop, exploring first hand the science behind the water cycle. But it’s not all wet and wild – through powerful interactive and local messaging, visitors realize that daily decisions can immediately improve the watershed in their own backyard. This exhibit is included with your general admission. Route 7, 9, 19 can get you to GRPM! Don’t miss this local production! Eliza Doolittle is a young flower seller with a thick Cockney accent. Professor Henry Higgins is an arrogant upper-class phonetics professor. A boastful wager sets them on a path of discovery that will change both of their lives. One of the most popular musicals of all time featuring Broadway classics: Wouldn’t It Be Loverly, With a Little Bit of Luck, Get Me To the Church on Time, and I Could Have Danced All Night. Tickets are $18-37 and can be purchased here. Ride Route 1, 4, 6, 14, 15 to get to the Civic Theatre. Join in the laughter from March 8 – 18 throughout Grand Rapids! GIlda’s LaughFest is a community-wide festival of laughter featuring a variety of events celebrating the health of laughter. This year, come out to see big names like Maria Bamford, Mike Birbiglia, Lewis Black and Wayne Brady. Browse the full event list and start planning your trip to a variety of comedy events. Various venues throughout West Michigan host events. Leave your car at home and ride with us to indulge in Kentwood’s finest on March 15! Sample food from over fifteen restaurants. You won’t want to miss this evening of food and fun at the City of Kentwood Parks and Recreation Department. Two sessions: 4:30-6:00pm and 6:30-8:00pm. Tickets are $6 in advance or $8 at the door. Kids 5 and under are free. Route 1 & 44 can get you there. Grab your green gear and get ready for some St. Patrick’s Day Fun on March 17! Stretching from Fulton to Oakes, and across Weston from Commerce, the event will consume three city-blocks including parking area #3. Travel responsibly and let The Rapid be your designated driver to and from this event.Get your tickets here. Throughout March, ride The Rapid to Blandford Nature Center for a variety of events. There’s the Sugarbush Tour on March 10, 48th Annual Sugarbush Festival on March 24 and the Eggtastic Exploration on March 31! View all of the events here. Route 7 can get you within walking distance to Blandford Nature Center.